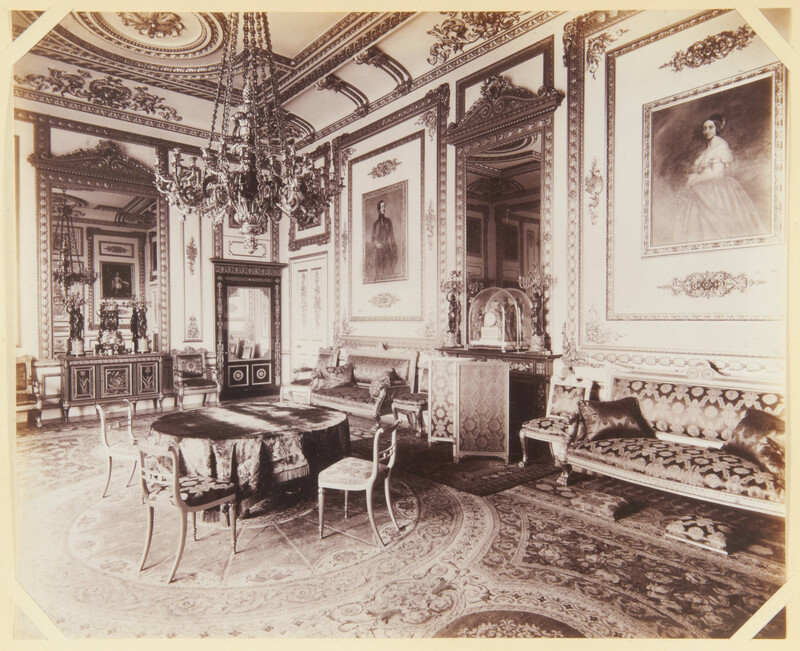 Photograph of the White Drawing Room, Semi-State Apartments. The floor is covered in an Axminster carpet, on which a round table covered with a velvet cloth and four chairs; a large gilt metal or wooden chandelier hangs over the table. There is a large overmantel mirror over the fireplace, which has a Remond mantel clock (RCIN 30017), a pair of candelabra (either RCINs 21691.1-2 or 21695.1-4, or 93012); on either sides are long settees and footstools. At the far end of the room is a large mirror and a pietra dura cabinet also with a pair of candelabra (RCIN 21699.1-2 or 21695.1-4) and possibly a clock with 3 female figures. On the wall are two Franz Winterhalter portraits of Prince Albert and Queen Victoria (RCINs 401412 and 401413); another Winterhalter portrait can be seen in the reflection of the large mirror, which is a portrait of the young Prince Albert Edward, later King Edward VII (RCIN 401411).